Elo, a leading global supplier of touchscreen solutions, will be exhibiting at InfoComm, June 6-8 at booth C1800, showcasing cutting-edge touchscreen digital signage helping to transform traditional signage into interactive self-service experiences. 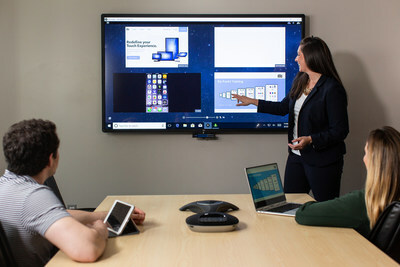 In-booth demonstrations include EloView software the secure platform for remote content deployment and device management, NEW collaboration solutions for education and business, touchscreen kiosks and an HD interactive video wall. MILPITAS, Calif., June 6, 2018 /PRNewswire/ -- Elo, a leading global supplier of touchscreen solutions, will be exhibiting at InfoComm in Las Vegas, June 6-8 at booth C1800, showcasing cutting-edge interactive digital signage, collaboration and self-service touchscreen solutions. The booth will feature Elo's latest touchscreens, customer demos, and partner installations—providing a full display of the latest in digital technology for enterprise, education, retail, hospitality and high-traffic public environments. Additional new products including Elo's Android-powered compute engine, the Elo Backpack™, versatile I-Series 2.0 touchscreens and a touch-through glass PCAP demo. The award-winning PanoScape™ experience, a state-of-the-art multi-functional video wall software created by DesignCentrix and utilizing Elo's commercial-grade large format 55-inch HD touchscreens. This demo replicates the PanoScape™ installation at Tulane University's AB Freeman School of Business.